My Cell Bikes fixie is my workhorse and go-to bike. I have probably ridden more than 15,000 km on this trusty steed. This entry was posted in Bicycles and tagged Cell, Cell Bikes on 17 March 2017 by Rex. That’s it. Done. My last ride completed for 2015, with a grand total of 4,542 kilometres ridden. 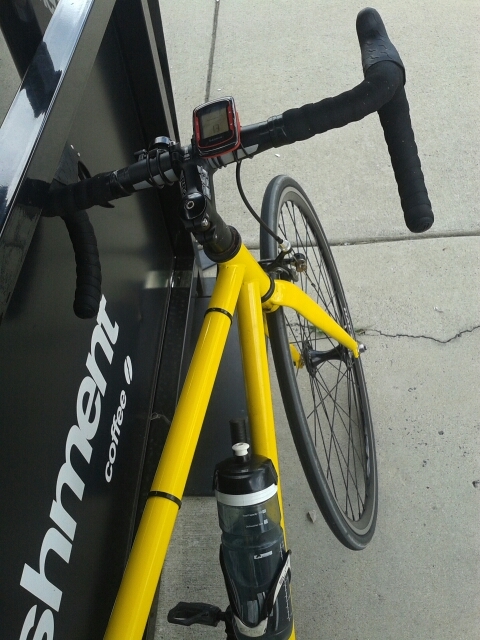 It is fitting that my last ride for the year was on my Cell Bikes fixie. While I have several bikes — five fixies, a singlespeed, a beaten-up mountain bike, and NO drop bar road bike — my Cell Bikes fixie has been my go-to bike. I have fancier bikes, including a Wabi Special and a Dolan track bike, but my Cell Bikes fixie has been my reliable riding companion. I first purchased my Cell Bikes fixie in 2011. Early on I put Halo Aerorage wheels on the bike (the original wheels are still in use on my roller bike, regularly being spun up to 80+ km/h on the rollers) and Vittoria Rubino Pro clincher tyres. Since then, my Cell Bikes fixie has had a new saddle (I wrecked the original one in a crash), had various handlebars including risers and drop bars, a new 144 BCD set of cranks, and various gear ratios including freehubs and fixed gears. 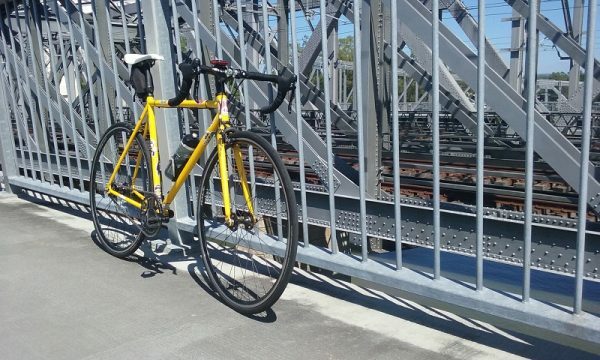 The bike has been ridden relentlessly since purchase, including being ridden on the Brisbane to Gold Coast charity ride, riding 102 km at an average speed of 31 km/h. With the ride to the start and from the finish, I put in more than 125 km in the saddle that day. I regularly ride the Brisbane River loop, and have ridden the bike up Mt Coot-tha. Late last year, I also stripped the brakes and accessories off the bike, fitted drop bars and short 165 mm 144 BCD cranks, and rode it on Chandler Velodrome — my introduction to track racing! Now, with the Halo Aerorage wheels, Vittoria Rubino Pro tyres, Shimano PRO drop bars, a Selle Italia saddle, and Genetic 170 mm 144 BCD cranks, my Cell fixie is my regular riding companion — I often spend more than 130 km on this bike each week. I am currently riding a 48 tooth chainring and 18 tooth sprocket, giving me a super sweet 72.0 gear inches. I can cruise at 30 km/h spinning at 90 rpm, climb hills, and spin out to more than 50 km/h in this gear. In 2016, my goal is to ride more than 5,000 km, and I am sure a large part of it will be ridden on my Cell Bikes fixie. This entry was posted in Bicycles and tagged Cell Bikes, Fixed Gear, Fixie on 18 December 2015 by Rex. One of the things that I love about cycling is getting shiny new chunks of metal in the mail. The TA Specialities chaingring is just such a piece of metal. Yumo. I recently entered the world of track racing at Chandler Velodrome. As any track rider knows, having a set of chainrings and cogs allows you to dial in the exact gear that you want. 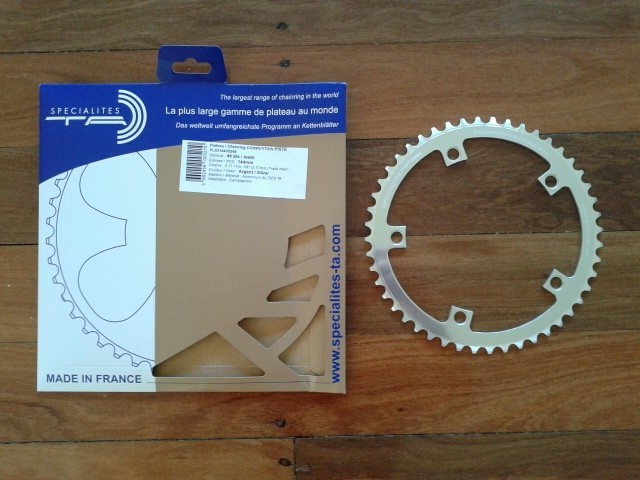 With 49, 50 and 51 tooth 1/8″ chainrings, I felt that I also needed a 48 tooth, hence the new TA Specialities chainring. 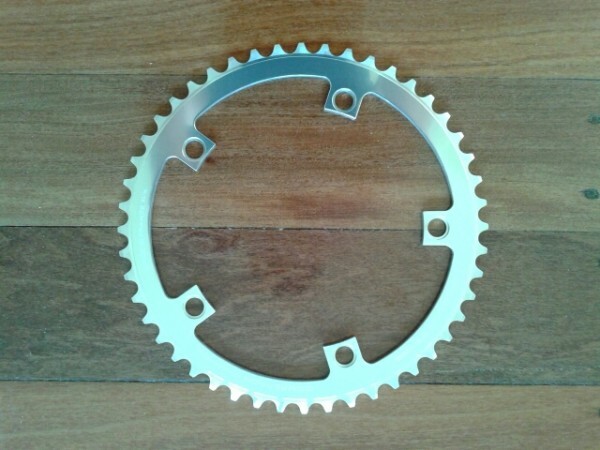 I also have 46, 48 and 52 tooth 3/32″ chainrings, but I use them on my Wabi Special. All these chainrings are in 144 BCD (bolt circle diameter) to fit my Andel cranksets on the Wabi Special and my Cell Bikes fixie configured as a track bike. This entry was posted in Bicycles and tagged Cell Bikes, Chainring, Fixie, TA Specialities, Track, Velodrome, Wabi Special on 11 September 2014 by Rex. 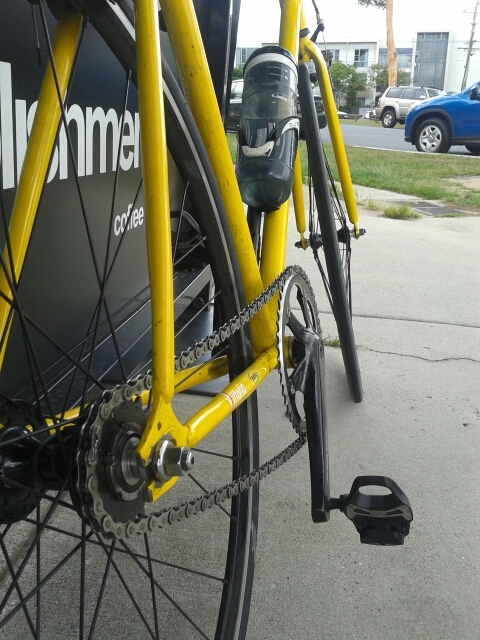 My yellow Cell Bikes fixie, which my kids have affectionately named Bumblebee, is currently configured as a track bike. My Cell Bikes fixies (I have two) have been through many guises, including a singlespeed ridden on the 100 km Brisbane to Gold Coast cycle ride at an average speed of more than 30 km/h, ridden up Mt Coot-tha, and configured as a sit-up town bike with swoopy bars. Recently I have been using a Cycling Queensland track hire bike to train on Chandler Velodrome in Brisbane, Queensland. 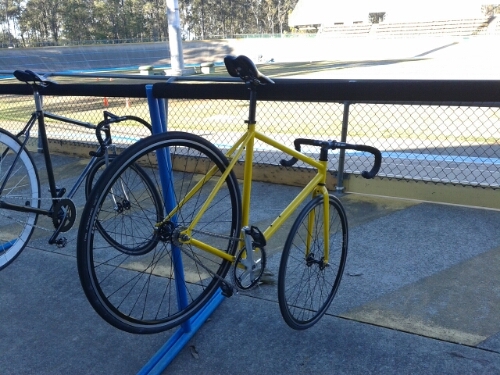 I was keen to ride one of my own bikes on the track and had heard of other people riding Cell Bikes fixies on velodromes. I stripped my Cell Bikes fixie of brakes and the water bottle cage, replaced the riser bars with PRO PLT compact drop bars, and put on some 165 mm 144 BCD Andel RSC1 cranks. I took the bike down to a training session to see whether it would be okay to ride on the track. My main concern was that with a 65 mm bottom bracket drop, the bike is at least 7 mm lower than a typical bunch-start track bike. However, with the shorter cranks, I was able to get enough clearance to ride safely around Chandler Velodrome. Chandler Velodrome, being an outdoor 333 metre track, has relatively shallow banking at around 30 degrees for an international standard velodrome. Indoor international standard velodromes are typically 250 metres (or less) and have banking of at least 42 degrees. On the other hand, many regional velodromes in Australia have track banking much shallower than Chandler Velodrome. My point is, if you are thinking of putting a Cell Bikes fixie on the track, check with your local club first. Depending on the track specifications, and how strict your club is, you may be able to put a Cell Bikes fixie on the track and safely have heaps of fun for not very much money! 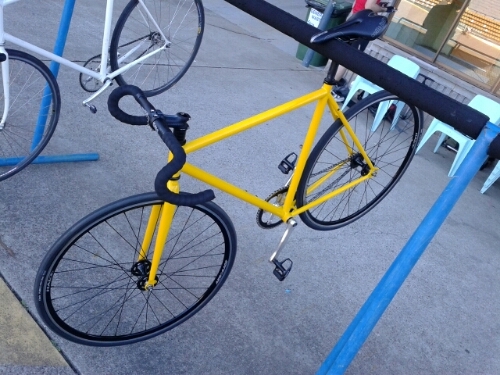 This entry was posted in Bicycles and tagged Bumblebee, Cell Bikes, Chandler Velodrome, Fixie, Track, Velodrome on 17 August 2014 by Rex. 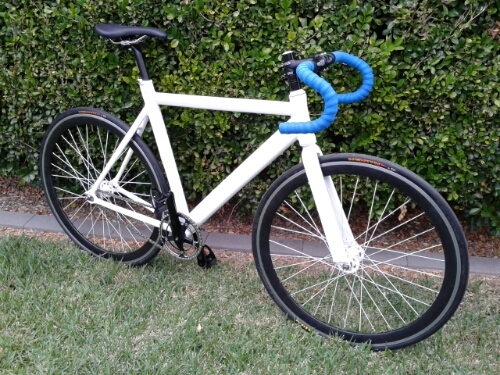 I decided to upgrade the cranks on my Cell Bikes fixie because I want to ride this bike on Chandler Velodrome. The original cranks were 170 mm and 130 bcd. I also wanted to be able to swap chainrings with my Wabi Special which has 144 bcd cranks/chainrings, so decided to upgrade the cranks on the Cell Bikes fixie to 165 mm 144 bcd Andel RSC1 cranks. 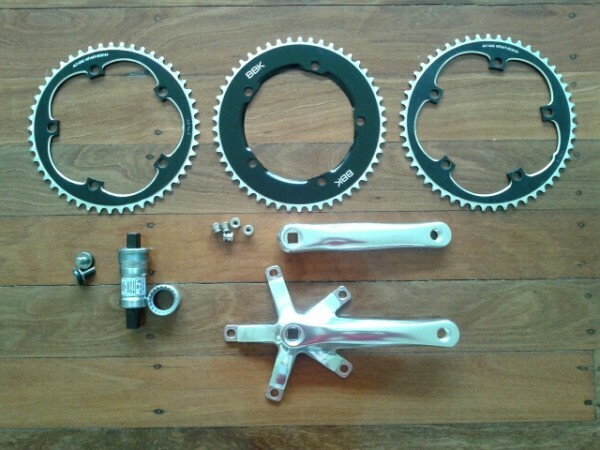 This meant also changing the bottom bracket to a 107 mm Shimano BB-UN55, as well as an assortment of chainrings. Kirrawee Cycles BBK 144 bcd chainrings 49 tooth (119 grams), 50 tooth (137 grams) and 51 tooth (124 grams). 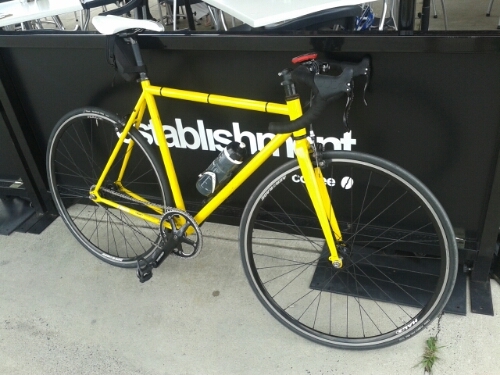 This entry was posted in Bicycles and tagged Andel, BBK, Bumblebee, Cell Bikes, Chandler Velodrome, Fixie, Kirrawee Cycles, Shimano, Weight Weenie on 14 August 2014 by Rex. Cycling Deal fixie/track frame TF-56W — finally built! 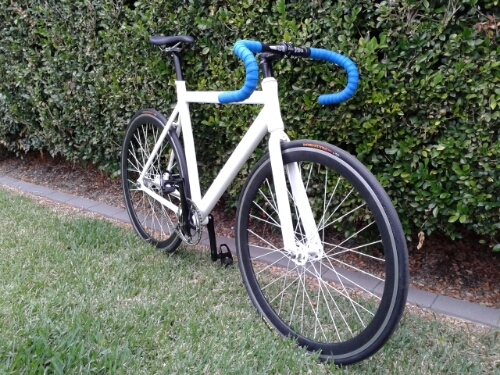 I have finally built up my Cycling Deal fixie/track frame TF-56W. I originally purchased this frame for a bike build project that I lost interest in when I purchased a Wabi Special. I was then going to build up the frame as a rain bike. I then realised that I had enough parts lying around to put together a bike to use to train on my rollers. The bike, as shown in the photos, with no brakes, but with pedals and heavy wheels and tires, weighs in at 9.0 kg. I am yet to cut down the fork steerer, and the handlebars and saddle need to be dialed in. The 56 cm frame/fork/headset was advertised as being 2.4 kg; by my kitchen scales, the frame is 1752 grams and forks are 882 grams — a total of 2.634 kg. That is a bare weight without the seat post or headset supplied with the frame. The Cell Bikes wheels came from my first fixie. I have weighed them (with rim tape, but no tubes/tyres/cog) on my kitchen scales at 1.361 kg for the front wheel and 1.433 kg for the rear wheel. They are not lightweight wheels, but they have withstood a good flogging, and are still lighter than many other cheap wheels on the market. The Maxxis Xenith tyres are also not light, but I was unable to weigh them. Investing in a half decent set of wheels and tyres should see a similar build using this frame down around 8 kg, which is not too bad. For more information on this bike, explore here and here. This entry was posted in Bicycles and tagged Beetlejuice, Cell Bikes, Cycling Deal, Fixie, Maxxis, Project Beetlejuice on 9 June 2014 by Rex. What is in the parts bin? Project Beetlejuice is coming to life! I had a dig around my parts bin on the weekend to see whether I could find another bike in there somewhere. It seems I could! I am just missing some handlebar tape and bottom bracket bolts (I have a sprocket and stem not shown too). 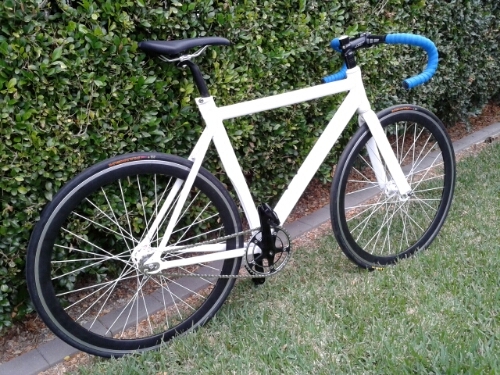 The frame is a Cycling Deal fixie/track frame TF-56W. 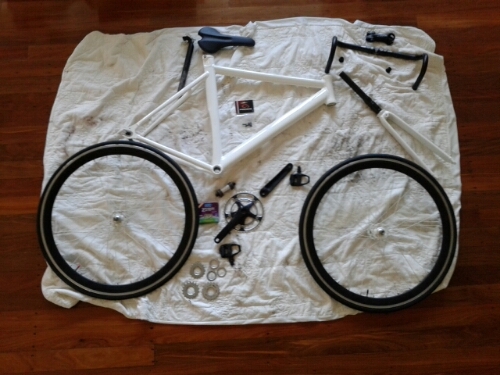 I bought it for another project, but then lost interest in building it when I got my Wabi Special. Being an aluminium frame, I thought about building it up as a rain bike, but really could not be bothered. When I realized that I had enough parts to almost build a bike to use to train on my rollers, I finally built it up. The wheels are from my first Cell Bikes fixie. I used them on my second Cell fixie for a while before replacing them. I have pulled them out of the shed to complete this bike. For more information on the bike, explore the Project Beetlejuice tag on this blog, and here and here. This entry was posted in Bicycles and tagged Beetlejuice, Cell Bikes, Cycling Deal, Fixie, Project Beetlejuice, TF-B, TF-W, Track on 2 June 2014 by Rex.